The conference began with the inaugural lecture delivered by our Distinguished Faculty member Shri. 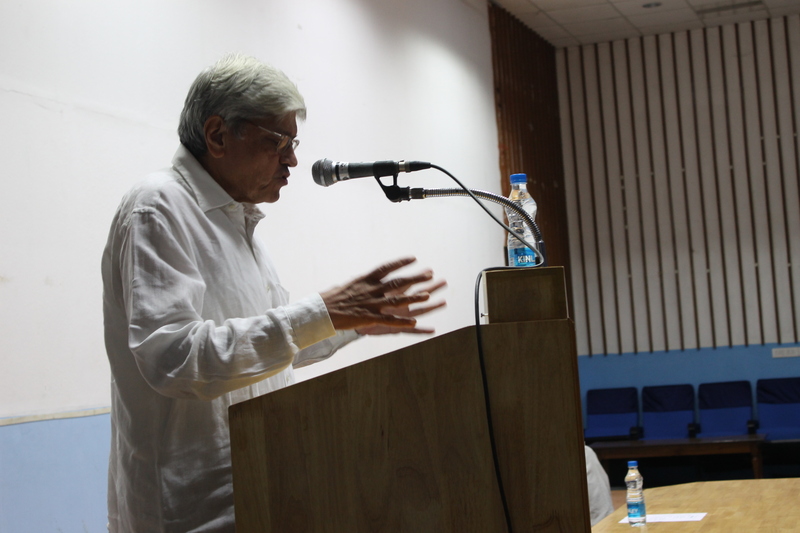 Gopal Krishna Gandhi, former Governor of West Bengal and an eminent officer of the Indian Administrative Service. In his lecture Mr. Gandhi touched upon various issues surrounding conflict and situated the theme in the larger context of the Indian society. He primarily pointed out to the subjectivity involved in our responses to conflictual situations. Discussion on conflict depends on which side of the fence you are. The people on one side want economic reforms to remain, where FDI is good, where labour laws should be scraped, where solar energy maybe good for our souls but nuclear energy is the sole panacea to our problems. However, there is the other side of the fence. While the slow growth of GDP causes concern, the dismal level of poverty alleviation measure is ignored. By citing statistics Mr Gandhi brought to light the contrasting perspective. Moving on, with illustrations he brought out the complexity of the Indian society. India itself is a land of conflicts. It is an amalgam of the worst and the best in the country. Along with trickery and selfishness exist selflessness. The only way to avoid conflicts in such a way is to promote inclusiveness. The conflicts of our country would be far easier to resolve if left to those mandated to resolve it and if these mandated do not doddle over it. However, he makes an exception for some conflicts where negotiation is not an option. For instance, those who discriminate against gender, those who perpetrate violence against minorities, caste conflicts do not fall under the ambit of discussion. Mr Gandhi then emphasised on the methods and tools employed to grapple with issues of conflict. Satyagraha has been an effective means for the same. It has been used by Africans against their governments and in many other instances. However, it will always be fraught with mishandling. There is a very thin line between the ethical and unethical use of Satyagraha. The other mechanisms and institutions he described were that of the RTI, civil society organisations and the constitutional entities like the CEG, CAG and NAC. On the issue of conflict in literature, Dalit Literature comes to the forefront. He spoke about the rising importance of the field of Dalit writing and gave examples of exceptional writers like Mahashweta Devi, and Bama. On a closing note he identified certain important public intellectuals like Arundhati Roy and their contribution to the understanding of the larger picture of conflict. Mr Gandhi’s comprehensive lecture not only took a peek at the theme of the conference but also set the ball rolling for the rest of the sessions. In short Negotiating Conflict 2012 could not have asked for a more befitting beginning. 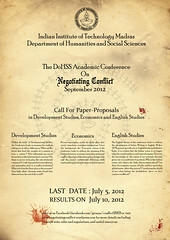 The English stream of Negotiating Conflict 2012, has as its theme, “Fractured Boundaries of Indian Writing in English”. Through this theme, we try to explore the various conflicts present within Indian Writing in English today. Starting with the much deliberated upon “authenticity” debate, the conference aims to go on towards topics such as challenging the mainstream genres of literature and examining the new genres and ideas, or lack of these, in contemporary IWE. The conference would also look at IWE in the light of recent global phenomena such as globalization and the new capitalist market driven literature in India. The conference features a keynote address, paper presentations and a panel discussion. The keynote address will be delivered by Dr.GJV Prasad. Two students will get the opportunity to present their papers at the conference, having come through rigorous competition from literature students across the country. The selected students will present their paper and will be followed by a panel discussion, where the ideas put forward in the two papers wll be discussed by the audience, the two authors and the panel. Check Schedule for more details. emphasis on growth rate has seen inequality rise across the globe. Enter your email address to follow "Negotiating Conflict" and receive notifications of new posts by email. DoHSS, IIT Madras Link to the Department of Humanities and Social Sciences, IIT Madras website. Facebook Group Become a member of the FB group and stay updated! IIT Madras Link to IIT Madras. Redefining Boundaries, Conference of 2010 The first academic conference of DoHSS, IIT Madras was under the theme “Redefining boundaries”. Follow the link to visit the blog of the first conference! Twitter Page Twitter handle of the conference, Negotiating Conflict!